There is a big market for portable toilets during the construction boom. Look skyward these days, and it’s hard not to find evidence of the city’s rapid growth, from the swinging cranes in the Seaport to the steel skeletons rising over the financial district. But as developers jostle for their share of Boston’s ever-expanding skyline, another battle — less glamorous but perhaps equally intense — is playing out at ground level, in the fenced-off lots of the area’s construction sites. In a curious but inevitable byproduct of the city’s epic construction boom, the market for portable toilets is on fire. New vendors are popping up, older ones are expanding, and big companies have swooped in — all fighting for an ever-larger slice of the surprisingly lucrative porta-potty pie. Call it Boston’s own game of thrones, complete with price wars, turf battles, and seemingly endless demand. In Woburn, for instance, Throne Depot, a portable-toilet rental agency known for its bright orange units and humorous logo, has been expanding exponentially. After starting the company a decade or so ago with just 26 toilets, co-owners Michael Cormier and Steve Brodeur have increased their fleet to 2,100 — 500 of which the company acquired just last year. For North Reading-based Flush Services, the jump has been equally stark. Take a five-minute stroll anywhere in Boston, and you’ll see plenty of evidence of a city-in-progress. Large-scale construction projects are taking place at the Longfellow Bridge, in Kendall Square, and amid the downtown skyscrapers. The city’s development agency lists more than 100 current projects across the city, including 42 where construction is active. All, of course, must be staffed by dozens of hard-hatted workers in need of occasional relief. With national labor regulations calling for at least one toilet for every 20 construction-site workers — and with some large-scale projects requiring as many as 500 on-site johns — it’s not exactly a surprise that the phones keep ringing. 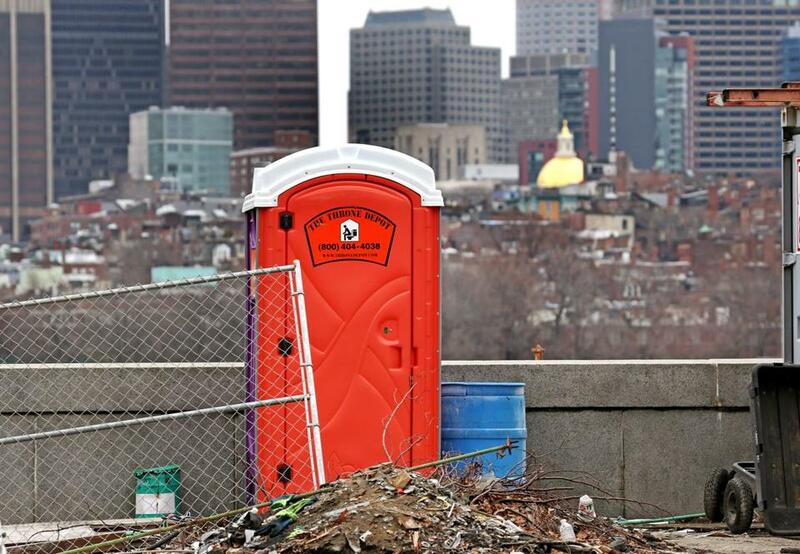 “Any time there’s a gathering of an outdoor workforce, there’s certain basic things about nature that you cannot change,” said Asit Goel, senior vice president of marketing and communications for Westborough-based portable toilet purveyor United Site Services, which supplies toilets for various construction sites across the city, as well as the Boston Marathon and the city’s Fourth of July celebration. 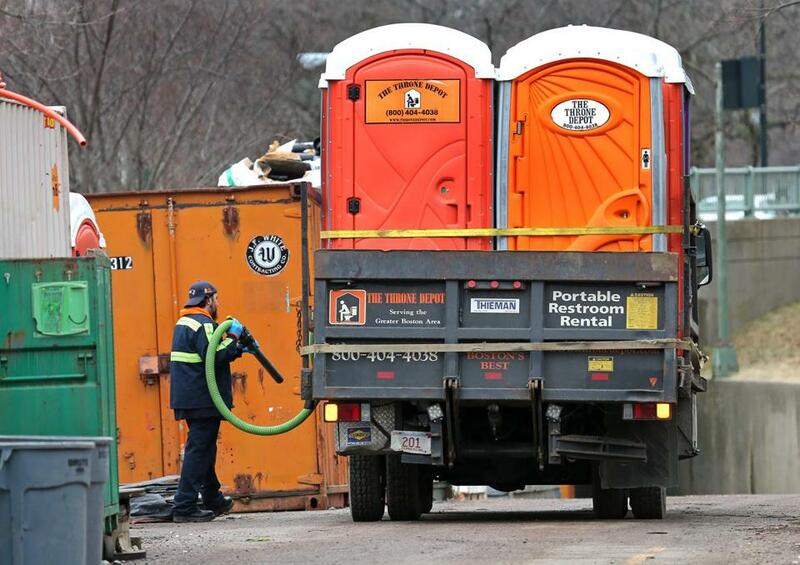 An employee cleaned a porta-potty at a Cambridge construction site. Still, it’s not all roses and potpourri. The industry, those in the business say, can be inherently tough. Finding workers willing to spend their days cleaning out portable toilets is a predictably difficult task. And the business seems to come with a clientele happy to point out any problems that might arise. 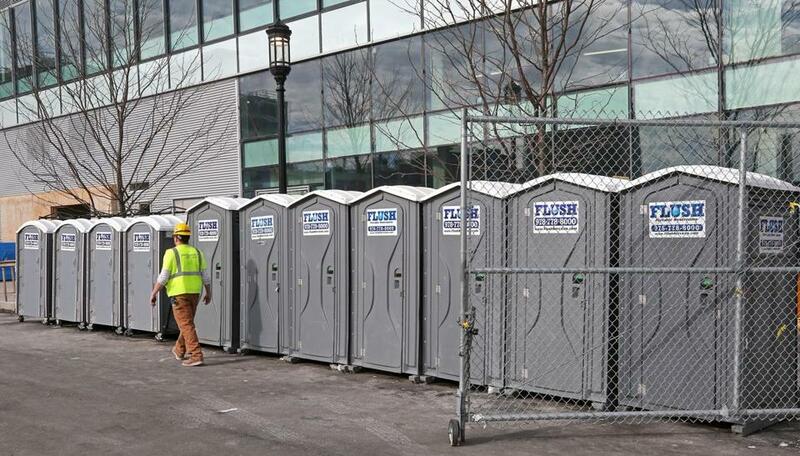 Construction at Pier Four in the Seaport had a portable toliet on almost every level. In some cases, simply maintaining a working inventory can be a challenge. Locally, vendors report portable toilets that have been graffitied, tipped over, blown up, set aflame, and — in one instance — chain-sawed through. A couple years back, Cormier said, he rented out five porta-potties for a fund-raising event in Newton. When an employee arrived later to pick them up, he found that one had been burned to the ground. The other four had simply vanished. Perhaps unsurprisingly, meanwhile, the boost in demand has brought increased competition with some large outfits gobbling up smaller players at a speedy clip. Westborough-based United Site Services, the nation’s largest provider of portable toilets — think Amazon of the porta-potty industry — has acquired more than 25 smaller companies in the past three years, including several throughout New England, allowing them to offer up prices, some local vendors say, that can be impossible to match. “It can be a bit cutthroat,” Cormier said. At the moment, anyway, there appears to be plenty of waste to go around. After a nearly 10 percent jump between 2015 and 2016, construction in the city shows no signs of slowing, with a number of large-scale projects — including the Winthrop Square Tower and the Omni hotel in the Seaport — slated to soon gain steam. And even if things do eventually wane, said Mark McKenna, business development and sales manager at waste-water company RM Ratta Corp. in Ayer, the industry finds itself uniquely positioned to continue without much impediment. A row of porta-potties at a construction site at 121 Seaport.